Image courtesy Jimena Giudice, Ph.D. Researchers used mouse models to characterize alternative splicing in genes that take place in the neonate as well as which mechanisms they affect in heart function. They also discovered a protein that regulates some of the alternative splicing and goes on to change dramatically in its expression during the postnatal period. 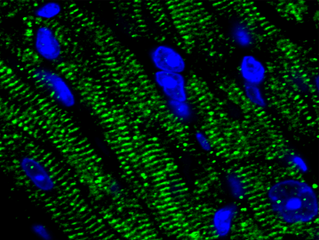 Researchers where able to identify and separate two cell types of the mouse heart, known as cardiomyocytes and cardiac fibroblasts. They used RNA sequencing to observe early- and late-stage development of these cells in the newborn. Cooper and colleagues were able to determine which genes are turned on and off and which ones underwent alternative splicing. Alternative splicing occurs with a pre-mRNA in the nucleus of a cell which leads to a different mature mRNAs which in turn leads to different protein products. Eukaryotic mRNA, unlike prokaryotic mRNA, contains exons and introns. Exons are the actual coding sequence for a protein. The introns are found in between exons and don’t code for anything, so they have to be removed. Once the introns are removed, the exons can be spliced together, however, they can also be connected in a different order, which means that different protein products can be generated from one gene. This mechanism is often used to generate different proteins from the same gene in the fetus, versus neonate, versus adult. The researchers were able to identify the CELF1 protein as being responsible for regulating specific alternative splicing events. By turning the CELF1 expression on and off at various points in development, Cooper and colleagues were able to see how the protein affected development at that particular stage. Cooper notes, “We looked at hundreds of genes that undergo alternative splicing and were able to see which ones are regulated by CELF1. We asked if is there anything in common among these genes and found that some were responsible for endocytosis and vesicular trafficking. So what is going on in heart development that is related to these processes associated with cell membrane dynamics?” It turns out that the cell membrane machinery that is required to coordinate contraction develops postnatally.